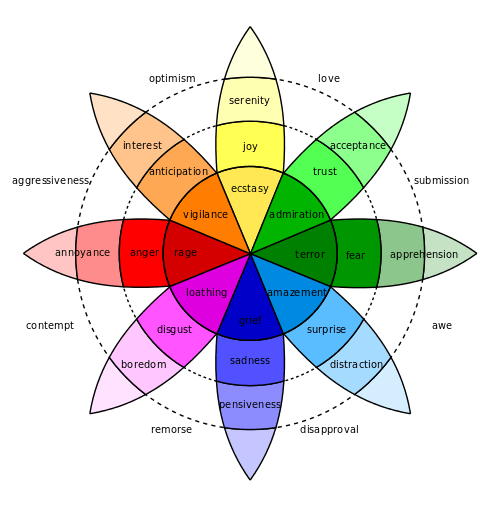 Emotional intelligence (EI) or emotional quotient (EQ) is the capability of individuals to recognize their own, and other people's emotions, to discriminate between different feelings and label them appropriately, to use emotional information to guide thinking and behavior, and to manage and/or adjust emotions to adapt environments or achieve one's goal(s). Although the term first appeared in a 1964 paper by Michael Beldoch, it gained popularity in the 1995 book by that title, written by the author, psychologist, and science journalist Daniel Goleman. Since this time Goleman's 1995 theory has been criticized within the scientific community. Studies have shown that people with high EI have greater mental health, job performance, and leadership skills although no causal relationships have been shown and such findings are likely to be attributable to general intelligence and specific personality traits rather than emotional intelligence as a construct. For example, Goleman indicated that EI accounted for 67% of the abilities deemed necessary for superior performance in leaders, and mattered twice as much as technical expertise or IQ. Other research finds that the effect of EI on leadership and managerial performance is non-significant when ability and personality are controlled for, and that general intelligence correlates very closely with leadership. Markers of EI and methods of developing it have become more widely coveted in the past decade. In addition, studies have begun to provide evidence to help characterize the neural mechanisms of emotional intelligence. Criticisms have centered on whether EI is a real intelligence and whether it has incremental validity over IQ and the Big Five personality traits. Review finds that, in most studies, poor research methodology has exaggerated the significance of EI. In 1989 Stanley Greenspan put forward a model to describe EI, followed by another by Peter Salovey and John Mayer published in the same year. Diagnostic Analysis of Non-verbal Accuracy – The Adult Facial version includes 24 photographs of equal amount of happy,sad, angry, and fearful facial expressions of both high and low intensities which are balanced by gender. The tasks of the participants is to answer which of the four emotions is present in the given stimuli. Konstantinos Vasilis Petrides ("K. V. Petrides") proposed a conceptual distinction between the ability based model and a trait based model of EI and has been developing the latter over many years in numerous publications. Trait EI is "a constellation of emotional self-perceptions located at the lower levels of personality." In lay terms, trait EI refers to an individual's self-perceptions of their emotional abilities. This definition of EI encompasses behavioral dispositions and self-perceived abilities and is measured by self report, as opposed to the ability based model which refers to actual abilities, which have proven highly resistant to scientific measurement. Trait EI should be investigated within a personality framework. An alternative label for the same construct is trait emotional self-efficacy. There are many self-report measures of EI, including the EQ-i, the Swinburne University Emotional Intelligence Test (SUEIT), and the Schutte EI model. None of these assess intelligence, abilities, or skills (as their authors often claim), but rather, they are limited measures of trait emotional intelligence. One of the more comprehensive and widely researched measures of this construct is the Trait Emotional Intelligence Questionnaire (TEIQue), which was specifically designed to measure the construct comprehensively and is available in many languages. The TEIQue provides an operationalization for the model of Petrides and colleagues, that conceptualizes EI in terms of personality. The test encompasses 15 subscales organized under four factors: well-being, self-control, emotionality, and sociability. The psychometric properties of the TEIQue were investigated in a study on a French-speaking population, where it was reported that TEIQue scores were globally normally distributed and reliable. Highly emotionally intelligent individuals are perceived more positively by others – Other individuals perceive those with high EI to be more pleasant,socially skilled and empathic to be around. Better psychological well-being.- Emotional intelligence is positively correlated with higher life satisfaction, self-esteem and lower levels of insecurity or depression. It is also negatively correlated with poor health choices and behavior. Further criticism has been leveled by Brody (2004), who claimed that unlike tests of cognitive ability, the MSCEIT "tests knowledge of emotions but not necessarily the ability to perform tasks that are related to the knowledge that is assessed". The main argument is that even though someone knows how he should behave in an emotionally laden situation, it doesn't necessarily follow that the person could actually carry out the reported behavior. New research is surfacing that suggests that ability EI measures might be measuring personality in addition to general intelligence. These studies examined the multivariate effects of personality and intelligence on EI and also corrected estimates for measurement error (which is often not done in some validation studies). For example, a study by Schulte, Ree, Carretta (2004), showed that general intelligence (measured with the Wonderlic Personnel Test), agreeableness (measured by the NEO-PI), as well as gender could reliably be used to predict the measure of EI ability. More formally termed socially desirable responding (SDR), faking good is defined as a response pattern in which test-takers systematically represent themselves with an excessive positive bias (Paulhus, 2002). This bias has long been known to contaminate responses on personality inventories (Holtgraves, 2004; McFarland & Ryan, 2000; Peebles & Moore, 1998; Nichols & Greene, 1997; Zerbe & Paulhus, 1987), acting as a mediator of the relationships between self-report measures (Nichols & Greene, 1997; Gangster et al., 1983). In an academic exchange, Antonakis and Ashkanasy/Dasborough mostly agreed that researchers testing whether EI matters for leadership have not done so using robust research designs; therefore, currently there is no strong evidence showing that EI predicts leadership outcomes when accounting for personality and IQ. Antonakis argued that EI might not be needed for leadership effectiveness (he referred to this as the "curse of emotion" phenomenon, because leaders who are too sensitive to their and others' emotional states might have difficulty making decisions that would result in emotional labor for the leader or followers). A recently published meta-analysis seems to support the Antonakis position: In fact, Harms and Credé found that overall (and using data free from problems of common source and common methods), EI measures correlated only ρ = 0.11 with measures of transformational leadership. Interestingly, ability-measures of EI fared worst (i.e., ρ = 0.04); the WLEIS (Wong-Law measure) did a bit better (ρ = 0.08), and the Bar-On measure better still (ρ = 0.18). However, the validity of these estimates does not include the effects of IQ or the big five personality, which correlate both with EI measures and leadership. In a subsequent paper analyzing the impact of EI on both job performance and leadership, Harms and Credé found that the meta-analytic validity estimates for EI dropped to zero when Big Five traits and IQ were controlled for. Joseph and Newman meta-analytically showed the same result for Ability EI. However, it is important to note that self-reported and Trait EI measures retain a fair amount of predictive validity for job performance after controlling Big Five traits and IQ. Newman, Joseph, and MacCann contend that the greater predictive validity of Trait EI measures is due to their inclusion of content related to achievement motivation, self efficacy, and self-rated performance. Meta-analytic evidence confirms that self-reported emotional intelligence predicts job performance well (as well as any other personality measure), and this is due to mixed EI and trait EI measures' tapping into self-efficacy and self-rated performance, in addition to the domains of Neuroticism, Extraversion, Conscientiousness, and IQ. The National Institute of Child Health and Human Development has recognized that because there are divisions about the topic of emotional intelligence, the mental health community needs to agree on some guidelines to describe good mental health and positive mental living conditions. In their section, "Positive Psychology and the Concept of Health," they explain. "Currently there are six competing models of positive health, which are based on concepts such as being above normal, character strengths and core virtues, developmental maturity, social-emotional intelligence, subjective well-being, and resilience. But these concepts define health in philosophical rather than empirical terms. Dr. [Lawrence] Becker suggested the need for a consensus on the concept of positive psychological health..."
A more recent study suggests that EI is not necessarily a universally positive trait. They found a negative correlation between EI and managerial work demands; while under low levels of managerial work demands, they found a negative relationship between EI and teamwork effectiveness. An explanation for this may suggest gender differences in EI, as women tend to score higher levels than men. This furthers the idea that job context plays a role in the relationships between EI, teamwork effectiveness, and job performance. Another interesting find was discussed in a study that assessed a possible link between EI and entrepreneurial behaviors and success. Although studies between emotional intelligence (EI) and job performance has shown mixed results of high and low correlations, EI is undeniably better predictor than most of the hiring methods commonly used in companies, such as letter of references, cover letter, among others. Fortunately, more companies are turning to EI tests for recruitment and training processes. By 2008, 147 companies and consulting firms in U.S had developed programmes that involved EI for training and hiring employees. Van Rooy and Viswesvaran (2004) showed that EI correlated significantly with different domains in performance, ranging from .24 for job performance to .10 for academic performance. These findings may contribute organisations in different ways. For instance, employees high on EI would be more aware of their own emotions and from others, which in turn, could lead companies to better profits and less unnecessary expenses. This is especially important for expatriate managers, who have to deal with mixed emotions and feelings, while adapting to a new working culture. Moreover, employees high in EI show more confidence in their roles, which allow them to face demanding tasks positively. Emotional Intelligence accounted for more career success than IQ. Similarly, other studies argued that employees high on EI perform substantially better than employees low in EI. This measured by self-reports and different work performance indicators, such as wages, promotions and salary increase. According to Lopes an his colleagues (2006), EI contributes to develop strong and positive relationships with co-workers and perform efficiently in work teams. This benefits performance of workers by providing emotional support and instrumental resources needed to succeed in their roles. Also, emotional intelligent employees have better resources to cope with stressing situations and demanding tasks, which enable them to outperform in those situations. For instance, Law et al. (2004) found that EI was the best predictor of job performance beyond general cognitive ability among IT scientist in computer company in China. Another study was made with employees from a telecommunication company in Pakistan. They tested the relationship between job performance and the four components of EI: self-awareness, self-management, social awareness and relationship management. They found that job performance was positively associated with relationship management and social awareness; and no significant association with self-awareness and self-management. Similarly, Sy, Tram, and O’Hara (2006) found that EI was associated positively with job performance in employees from a food service company. In the job performance – emotional intelligence correlation is important to consider the effects of managing up, which refers to the good and positive relationship between the employee and his/her supervisor. Previous research found that quality of this relationship could interfere in the results of the subjective rating of job performance evaluation. Emotional intelligent employees devote more of their working time on managing their relationship with supervisors. Hence, the likelihood of obtaining better results on performance evaluation is greater for employees high in EI than for employees with low EI. Based on theoretical and methodological approaches, EI measures are categorized in three main streams: (1) stream 1: ability-based measures (e.g. MSCEIT), (2) stream 2: self-reports of abilities measures (e.g. SREIT, SUEIT and WLEIS) and (3) stream 3: mixed-models (e.g. AES, ECI, EI questionnaire, EIS, EQ-I and GENOS), which include measures of EI and traditional social skills. O’Boyle Jr. an his colleagues (2011) found that the three EI streams together had a positive correlation of 0.28 with job performance. Similarly, each of EI streams independently obtained a positive correlation of 0.24, 0.30 and 0.28, respectively. Stream 2 and 3 showed an incremental validity for predicting job performance over and above personality (Five Factor model) and general cognitive ability. Both, stream 2 and 3 were the second most important predictor of job performance below general cognitive ability. Stream 2 explained 13.6% of the total variance; whereas stream 3, explained 13.2%. In order to examine the reliability of these findings, a publication bias analysis was developed. Results indicated that studies on EI-job performance correlation prior to 2010 do not present substantial evidences to suggest the presence of publication bias. A small 2004 study by Ellen Paek empirically examined the extent to which religiosity, operationalized as religious orientation and religious behavior, is related to the controversial idea of emotional intelligence (EI). The study examined the extent to which religious orientation and behavior were related to self-reported EI in 148 church attending adult Christians. Non-religious individuals were not part of the study. The study found that the individuals' self-reported religious orientation was positively correlated with their perceiving themselves to have greater EI. While the number of religious group activities was positively associated with perceived EI, number of years of church attendance was unrelated. Significant positive correlations were also found between level of religious commitment and perceived EI. Thus, the Christian volunteers were more likely to consider themselves emotionally intelligent if they spent more time in group activities and had more commitment to their beliefs. Tischler, Biberman and McKeage warn that there is still ambiguity in the above concepts. In their 2002 article, entitled "Linking emotional intelligence, spirituality and workplace performance: Definitions, models and ideas for research", they reviewed literature on both EI and various aspect of spirituality. They found that both EI and spirituality appear to lead to similar attitudes, behaviors and skills, and that there often seems to be confusion, intersection and linking between the two constructs. 1 2 Coleman, Andrew (2008). A Dictionary of Psychology (3 ed.). Oxford University Press. ISBN 9780199534067. ↑ Goleman, D. (1998). Working With Emotional Intelligence. New York, NY. Bantum Books. ↑ Cavazotte, Flavia; Moreno, Valter; Hickmann, Mateus (2012). "Effects of leader intelligence, personality and emotional intelligence on transformational leadership and managerial performance". The Leadership Quarterly. 23 (3): 443–455. doi:10.1016/j.leaqua.2011.10.003. ↑ Atwater, Leanne; Yammarinol, Francis (1993). "Personal attributes as predictors of superiors' and subordinates' perceptions of military academy leadership". Human Relations. 46 (5): 645–668. doi:10.1177/001872679304600504. ↑ Barbey, Aron K.; Colom, Roberto; Grafman, Jordan (2012). "Distributed neural system for emotional intelligence revealed by lesion mapping". Social Cognitive and Affective Neuroscience. 9 (3): 265–272. doi:10.1093/scan/nss124. PMID 23171618. ↑ "Scientists Complete 1st Map of 'Emotional Intelligence' in the Brain". US News and World Report. 2013-01-28. ↑ Harms, P. D.; Credé, M. (2010). "Remaining Issues in Emotional Intelligence Research: Construct Overlap, Method Artifacts, and Lack of Incremental Validity". Industrial and Organizational Psychology: Perspectives on Science and Practice. 3 (2): 154–158. doi:10.1111/j.1754-9434.2010.01217.x. ↑ Hunt, James; Fitzgerald, Martin (2013). "The relationship between emotional intelligence and transformational leadership: An investigation and review of competing claims in the literature". American International Journal of Social Science. 2 (8): 30–38. ↑ Leuner, B (1966). "Emotional intelligence and emancipation". Praxis der Kinderpsychologie und Kinderpsychiatrie. 15: 193–203. ↑ Smith, M.K. (2002) "Howard Gardner and multiple intelligences", The Encyclopedia of Informal Education, downloaded from http://www.infed.org/thinkers/gardner.htm on October 31, 2005. ↑ Salovey, P.; Mayer, J.D. (1989). "Emotional intelligence". Imagination, Cognition, and Personality. 9 (3): 185–211. doi:10.2190/dugg-p24e-52wk-6cdg. ↑ Goleman, D., (1995) Emotional Intelligence, New York, NY, England: Bantam Books, Inc.
↑ "Dan Goleman". Huffingtonpost.com. Retrieved 2014-03-07. ↑ Dan Schawbel. "Daniel Goleman on Leadership and The Power of Emotional Intelligence – Forbes". Web.archive.org. Archived from the original on 2012-11-04. Retrieved 2014-03-07. ↑ "Why emotional intelligence is just a fad – CBS News". Web.archive.org. 2012-02-13. Archived from the original on 2012-11-28. Retrieved 2014-03-07. 1 2 3 Petrides, K.V. ; Furnham, A. (2000a). "On the dimensional structure of emotional intelligence". Personality and Individual Differences. 29: 313–320. doi:10.1016/s0191-8869(99)00195-6. 1 2 3 4 5 6 7 8 9 10 11 12 13 14 15 16 17 18 Mayer, John D (2008). "Human Abilities: Emotional Intelligence". Annual Review of Psychology. 59: 507–536. doi:10.1146/annurev.psych.59.103006.093646. ↑ Kluemper, D.H. (2008). "Trait emotional intelligence: The impact of core-self evaluations and social desirability". Personality and Individual Differences. 44 (6): 1402–1412. doi:10.1016/j.paid.2007.12.008. 1 2 Martins, A.; Ramalho, N.; Morin, E. (2010). "A comprehensive meta-analysis of the relationship between emotional intelligence and health". Journal of Personality and Individual Differences. 49 (6): 554–564. doi:10.1016/j.paid.2010.05.029. ↑ Mayer, J.D. ; Salovey, P.; Caruso, D.L. ; Sitarenios, G. (2001). "Emotional intelligence as a standard intelligence". Emotion. 1: 232–242. doi:10.1037/1528-3542.1.3.232. ↑ MacCann, C.; Joseph, D.L. ; Newman, D.A. ; Roberts, R.D. (2014). "Emotional intelligence is a second-stratum factor of intelligence: Evidence from hierarchical and bifactor models". Emotion. 14: 358–374. doi:10.1037/a0034755. ↑ Mayer, J.D., & Salovey, P. (1997). What is emotional intelligence? In P. Salovey & D. Sluyter (Eds. ), Emotional development and emotional intelligence: Implications for educators (pp. 3–31). New York: Basic Books. 1 2 3 Salovey, P; Grewal, D (2005). "The Science of Emotional Intelligence". Current Directions in Psychological Science. 14: 6. doi:10.1111/j.0963-7214.2005.00381.x. ↑ Bradberry, T.; Su, L. (2003). "Ability-versus skill-based assessment of emotional intelligence" (PDF). Psicothema. pp. 59–66. Retrieved 2014-03-07. ↑ Brackett M.A. & J.D. Mayer, M.A. & J.D. (2003). "Convergent, discriminant, and incremental validity of competing measures of emotional intelligence". Personality and social psychology bulletin. 29 (9): 1147–1158. doi:10.1177/0146167203254596. ↑ Mayer, J.D. ; Salovey, P.; Caruso, D.R. ; Sitarenios, G. (2003). "Measuring emotional intelligence with the MSCEIT V2.0". Emotion. 3: 97–105. doi:10.1037/1528-3542.3.1.97. ↑ "Hallvard Føllesdal – 'Emotional Intelligence as Ability: Assessing the Construct Validity of Scores from the Mayer-Salovey-Caruso Emotional Intelligence Test (MSCEIT)' PhD Thesis and accompanying papers – University of Oslo 2008". ↑ Boyatzis, R., Goleman, D., & Rhee, K. (2000). Clustering competence in emotional intelligence: insights from the emotional competence inventory (ECI). In R. Bar-On & J.D.A. Parker (eds. ): Handbook of emotional intelligence (pp. 343–362). San Francisco: Jossey-Bass. 1 2 3 4 Petrides, K.V. ; Pita, R.; Kokkinaki, F. (2007). "The location of trait emotional intelligence in personality factor space". British Journal of Psychology. 98: 273–289. doi:10.1348/000712606x120618. ↑ Petrides, K.V. ; Furnham, A. (2001). "Trait emotional intelligence: Psychometric investigation with reference to established trait taxonomies". European Journal of Personality. 15: 425–448. doi:10.1002/per.416. ↑ Pérez, J.C., Petrides, K.V., & Furnham, A. (2005). Measuring trait emotional intelligence. In R. Schulze and R.D. Roberts (Eds. ), International Handbook of Emotional Intelligence (pp.181–201). Cambridge, MA: Hogrefe & Huber. ↑ Petrides, K.V. ; Furnham, A. (2003). "Trait emotional intelligence: behavioral validation in two studies of emotion recognition and reactivity to mood induction". European Journal of Personality. 17: 39–75. doi:10.1002/per.466. ↑ Mikolajczak, Luminet; Leroy; Roy (2007). "Psychometric Properties of the Trait Emotional Intelligence Questionnaire: Factor Structure, Reliability, Construct, and Incremental Validity in a French-Speaking Population". Journal of Personality Assessment. 88 (3): 338–353. doi:10.1080/00223890701333431. ↑ Vernon, P.A. ; Petrides, K.V. ; Bratko, D.; Schermer, J.A. (2008). "A behavioral genetic study of trait emotional intelligence". Emotion. 8 (5): 635–642. doi:10.1037/a0013439. PMID 18837613. ↑ Gardner, J. K.; Qualter, P. (2010). "Concurrent and incremental validity of three trait emotional intelligence measures". Australian Journal of Psychology. 62: 5–12. doi:10.1080/00049530903312857. 1 2 Locke, E.A. (2005). "Why emotional intelligence is an invalid concept". Journal of Organizational Behavior. 26 (4): 425–431. doi:10.1002/job.318. 1 2 3 Landy, F.J. (2005). "Some historical and scientific issues related to research on emotional intelligence". Journal of Organizational Behavior. 26: 411–424. doi:10.1002/job.317. ↑ Mikolajczak, M.; Luminet, O.; Leroy, C.; Roy, E. (2007). "Psychometric properties of the Trait Emotional Intelligence Questionnaire". Journal of Personality Assessment. 88: 338–353. doi:10.1080/00223890701333431. ↑ Smith, L.; Ciarrochi, J.; Heaven, P. C. L. (2008). "The stability and change of trait emotional intelligence, conflict communication patterns, and relationship satisfaction: A one-year longitudinal study". Personality and Individual Differences. 45: 738–743. doi:10.1016/j.paid.2008.07.023. ↑ Austin, E.J. (2008). "A reaction time study of responses to trait and ability emotional intelligence test items". Personality and Individual Differences. 46: 381–383. doi:10.1016/j.paid.2008.10.025. ↑ Roberts, R.D. ; Zeidner, M.; Matthews, G. (2001). "Does emotional intelligence meet traditional standards for an intelligence? Some new data and conclusions". Emotion. 1: 196–231. doi:10.1037/1528-3542.1.3.196. ↑ Brody, N (2004). "What cognitive intelligence is and what emotional intelligence is not" (PDF). Psychological Inquiry. 15 (3): 234–238. doi:10.1207/s15327965pli1503_03. ↑ Schulte, M. J.; Ree, M. J.; Carretta, T. R. (2004). "Emotional intelligence: Not much more than g and personality". Personality and Individual Differences. 37: 1059–1068. doi:10.1016/j.paid.2003.11.014. ↑ Fiori, M.; Antonakis, J. (2011). "The ability model of emotional intelligence: Searching for valid measures". Personality and Individual Differences. 50 (3): 329–334. doi:10.1016/j.paid.2010.10.010. ↑ Antonakis, J.; Dietz, J. (2011a). "Looking for Validity or Testing It? The Perils of Stepwise Regression, Extreme-Scores Analysis, Heteroscedasticity, and Measurement Error". Personality and Individual Differences. 50 (3): 409–415. doi:10.1016/j.paid.2010.09.014. ↑ Antonakis, J.; Dietz, J. (2011b). "More on Testing for Validity Instead of Looking for It". Personality and Individual Differences. 50 (3): 418–421. doi:10.1016/j.paid.2010.10.008. ↑ Antonakis, J.; Ashkanasy, N. M.; Dasborough, M. (2009). "Does leadership need emotional intelligence?". The Leadership Quarterly. 20 (2): 247–261. doi:10.1016/j.leaqua.2009.01.006. ↑ Harms, P. D.; Credé, M. (2010). "Emotional Intelligence and Transformational and Transactional Leadership: A Meta-Analysis". Journal of Leadership & Organizational Studies. 17 (1): 5–17. doi:10.1177/1548051809350894. ↑ Bar-On, R (2006). "The Bar-On model of emotional-social intelligence (ESI)". Psicothema. 18: 13–25. 1 2 3 Joseph, D. L.; Newman, D. A. (2010). "Emotional Intelligence: An Integrative Meta-Analysis and Cascading Model". Journal of Applied Psychology. 95 (1): 54–78. doi:10.1037/a0017286. ↑ Newman, D. A.; Joseph, D. L.; MacCann, C. (2010). "Emotional Intelligence and Job Performance: The Importance of Emotion Regulation and Emotional Labor Context". Industrial and Organizational Psychology: Perspectives on Science and Practice. 3 (2): 159–164. doi:10.1111/j.1754-9434.2010.01218.x. 1 2 Joseph, D.L. ; Jin, J.; Newman, D.A. ; O'Boyle, E.H. (2015). "Why Does Self-Reported Emotional Intelligence Predict Job Performance? A Meta-Analytic Investigation of Mixed EI". Journal of Applied Psychology. 100: 298–342. doi:10.1037/a0037681. ↑ Nitkin, Ralph. "National Advisory Board on Medical Rehabilitation Research: Meeting for Minutes for December 2–3, 2004". usa.gov. Archived from the original on 2009-07-16. Retrieved 2006-08-29. ↑ Lamb, Jennifer; Pepler, Debra J.; Craig, Wendy (2009-04-01). "Approach to bullying and victimization". Canadian Family Physician. 55 (4): 356–360. ISSN 0008-350X. PMC 2669002 . PMID 19366941. ↑ Kokkinos, Constantinos M.; Kipritsi, Eirini (2011-07-26). "The relationship between bullying, victimization, trait emotional intelligence, self-efficacy and empathy among preadolescents". Social Psychology of Education. 15 (1): 41–58. doi:10.1007/s11218-011-9168-9. ISSN 1381-2890. ↑ Lomas, Justine; Stough, Con; Hansen, Karen; Downey, Luke A. (2012-02-01). "Brief report: Emotional intelligence, victimisation and bullying in adolescents". Journal of Adolescence. 35 (1): 207–211. doi:10.1016/j.adolescence.2011.03.002. ↑ Mayer, J.D. ; Roberts, R.D; Barasade, S.G. (2008). "Human abilities: Emotional intelligence". Annual Review of Psychology. 59: 507–536. doi:10.1146/annurev.psych.59.103006.093646. ↑ Tolegenova, A.A.; Jakupov, S.M. ; Cheung Chung, Man; Saduova, S.; Jakupov, M.S (2012). "A theoretical formation of emotional intelligence and childhood trauma among adolescents". Procedia – Social and Behavioral Sciences. 69: 1891–1894. doi:10.1016/j.sbspro.2012.12.142. ↑ Cote, S.; Miners, C.T.H. (2006). "Emotional intelligence, cognitive intelligence and job performance". Administrative Science Quarterly. 51 (1): 1–28. ↑ Relojo, D.; Pilao, S.J. ; Dela Rosa, R. (2015). "From passion to emotion: Emotional quotient as predictor of work attitude behavior among faculty member". Journal on Educational Psychology. 8 (4): 1–10. Retrieved 27 July 2015. ↑ Farh, C. C.; Seo, Tesluk (March 5, 2012). "Emotional Intelligence, Teamwork Effectiveness, and Job Performance: The Moderating Role of Job Context". Journal of Applied Psychology. Advance online publication: 890–900. doi:10.1037/a0027377. ↑ Joseph, Dana L.; Jin, Jing; Newman, Daniel A.; O’Boyle, Ernest H. "Why does self-reported emotional intelligence predict job performance? A meta-analytic investigation of mixed EI.". Journal of Applied Psychology. 100 (2): 298–342. doi:10.1037/a0037681. 1 2 Van Rooy, David L; Viswesvaran, Chockalingam (2004-08-01). "Emotional intelligence: A meta-analytic investigation of predictive validity and nomological net". Journal of Vocational Behavior. 65 (1): 71–95. doi:10.1016/S0001-8791(03)00076-9. 1 2 3 Sy, Thomas; Tram, Susanna; O’Hara, Linda A. (2006-06-01). "Relation of employee and manager emotional intelligence to job satisfaction and performance". Journal of Vocational Behavior. 68 (3): 461–473. doi:10.1016/j.jvb.2005.10.003. ↑ Goleman, Daniel (1994). Emotional Intelligence. Bantam Books. ISBN 9780747526254. 1 2 Law, Kenneth S.; Wong, Chi-Sum; Song, Lynda J. "The Construct and Criterion Validity of Emotional Intelligence and Its Potential Utility for Management Studies.". Journal of Applied Psychology. 89 (3): 483–496. doi:10.1037/0021-9010.89.3.483. 1 2 Lopes, Paulo N.; Grewal, Daisy; Kadis, Jessica; Gall, Michelle; Salovey, Peter (2006-01-01). "Evidence that emotional intelligence is related to job performance and affect and attitudes at work". Psicothema. 18 Suppl: 132–138. ISSN 0214-9915. PMID 17295970. ↑ Seibert, Scott E.; Kraimer, Maria L.; Liden, Robert C. (2001-01-01). "A Social Capital Theory of Career Success". The Academy of Management Journal. 44 (2): 219–237. doi:10.2307/3069452. JSTOR 3069452. ↑ "African Journal of Business Management". www.academicjournals.org. Retrieved 2016-04-19. ↑ Vratskikh, Ivan; Masa'deh, Ra'ed (Moh’dTaisir); Al-Lozi, Musa; Maqableh, Mahmoud (2016-01-25). "The Impact of Emotional Intelligence on Job Performance via the Mediating Role of Job Satisfaction". International Journal of Business and Management. 11 (2): 69. doi:10.5539/ijbm.v11n2p69. ISSN 1833-8119. ↑ "What Everyone Should Know About Managing Up". Harvard Business Review. Retrieved 2016-04-19. ↑ Janssen, Onne; Yperen, Nico W. Van (2004-06-01). "Employees' Goal Orientations, the Quality of Leader-Member Exchange, and the Outcomes of Job Performance and Job Satisfaction". Academy of Management Journal. 47 (3): 368–384. doi:10.2307/20159587. ISSN 0001-4273. ↑ Ashkanasy, Neal M.; Daus, Catherine S. (2005-06-01). "Rumors of the death of emotional intelligence in organizational behavior are vastly exaggerated". Journal of Organizational Behavior. 26 (4): 441–452. doi:10.1002/job.320. ISSN 1099-1379. ↑ O'Boyle, Ernest H.; Humphrey, Ronald H.; Pollack, Jeffrey M.; Hawver, Thomas H.; Story, Paul A. (2011-07-01). "The relation between emotional intelligence and job performance: A meta-analysis". Journal of Organizational Behavior. 32 (5): 788–818. doi:10.1002/job.714. ISSN 1099-1379. ↑ Côté, Stéphane; Miners, Christopher T. H. (2006-01-01). "Emotional Intelligence, Cognitive Intelligence, and Job Performance". Administrative Science Quarterly. 51 (1): 1–28. JSTOR 20109857. ↑ Farh, Crystal I. C. Chien; Seo, Myeong-Gu; Tesluk, Paul E. "Emotional intelligence, teamwork effectiveness, and job performance: The moderating role of job context.". Journal of Applied Psychology. 97 (4): 890–900. doi:10.1037/a0027377. ↑ Joseph, Dana L.; Newman, Daniel A. "Emotional intelligence: An integrative meta-analysis and cascading model.". Journal of Applied Psychology. 95 (1): 54–78. doi:10.1037/a0017286. ↑ Moon, Tae Won; Hur, Won-Moo (2011-09-01). "Emotional Intelligence, Emotional Exhaustion, And Job Performance". Social Behavior and Personality: an international journal. 39 (8): 1087–1096. doi:10.2224/sbp.2011.39.8.1087. ↑ Schutte (1 April 2007). "A meta-analytic investigation of the relationship between emotional intelligence and health". ResearchGate. ↑ Alexandra Martins (1 October 2010). "A comprehensive meta-analysis of the relationship between Emotional Intelligence and health". ResearchGate. ↑ Paek, Ellen (2006). "Religiosity and perceived emotional intelligence among Christians". Personality and Individual Differences. International Society for the Study of Individual Differences. 41 (3): 479–490. doi:10.1016/j.paid.2006.01.016. ISSN 0191-8869. ↑ Tischler, L; Biberman, J.; McKeage, R. (2002). "Linking emotional intelligence, spirituality and workplace performance: Definitions, models and ideas for research". Journal of Managerial Psychology. Emerald Group Publishing Limited. 17 (3): 203–218. doi:10.1108/02683940210423114. ISSN 0268-3946. Retrieved 2008-10-18. ↑ Brown, Chiu; Chiu, Edmond; Neill, Lloyd; Tobin, Juliet; Reid, John (16 Jan 2012). "Is low emotional intelligence a primary causal factor in drug and alcohol addiction?". Australian Academic Press (Bowen Hills, QLD, Australia): 91–101.